Debating U.S. Foreign Policy: Where are the Women? But there’s a dearth when it comes to women’s voices in U.S. media coverage of foreign policy issues, according to the co-founders of Foreign Policy Interrupted, a new organisation aimed at amplifying women’s voices in the media. “There is a disparity between the number of women [and men] we see commenting on foreign policy issues,” said co-founder Elmira Bayrasli to a packed room of women (and a few men) at the Washington-based New America Foundation (NAF) Feb. 4. “Those who say that they make an effort to include women, but cannot find any are pushing a load of B.S.,” Suzanne Dimaggio, an expert dialogue practitioner who runs NAF’s Iran programme from New York, told IPS. “Women tend to over-prepare and over-research,” agreed NAF co-panelist Karen Finney, a former political consultant and MSNBC commentator who now consults for the watchdog organisation, Media Matters for America. 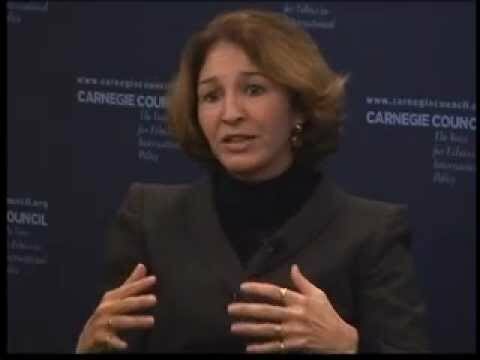 “I do think there’s this sense [among women that what they send to editors] has got to be really, really good, and honestly there’s a point when the best is the enemy of the good,” added moderator and NAF president Anne-Marie Slaughter who was the director of policy planning at the State Department from 2009-11. “There’s also males who want to hog this stuff,” said Steven Cook, a senior fellow at the well-known think tank, the Council on Foreign Relations, during questions and answers. “I started at the Council of Foreign Relations a decade ago…I had written a dissertation and by the luck of God was offered a position and on day one I got a phone call from someone [at a major broadcasting network asking if I could] come on and talk about something I absolutely knew nothing [about],” he said. Dimaggio, a mother and wife who was getting ready to board a flight to the Munich Security Conference the day IPS reached her, has an impressive resume of achievements and contributions to the world of U.S. foreign policy. But even she acknowledged that especially earlier in her career there were occasions when her abilities had been underestimated because she is a woman. “Things are getting better, but we still have a long way to go,” she said. “This problem won’t be resolved by only pressing those in positions of power to include more women. That certainly is a big piece of this. But, we, as women, must change our own behaviour,” added Dimaggio. “We realised that the magazine needed to be better, that there were too many of the same voices, and that our publication, which covers the ‘big tent’ of foreign policy, would not be adequately representative if it didn’t include women’s voices,” Executive Editor Ben Pauker told IPS.